Rio, D. D., Rodriguez-Mateos, A., Spencer, J. P., Tognolini, M., Borges, G., & Crozier, A. (2013). Dietary (Poly)phenolics in Human Health: Structures, Bioavailability, and Evidence of Protective Effects Against Chronic Diseases.Antioxidants & Redox Signaling, 18(14), 1818-92. Tsao, R. (2010). Chemistry and Biochemistry of Dietary Polyphenols. Nutrients, 2(12), 1231-46. Larson, A. J., Symons, J. D., & Jalili, T. (2012). Therapeutic Potential of Quercetin to Decrease Blood Pressure: Review of Efficacy and Mechanisms. Advances in Nutrition: An International Review Journal, 3(1), 39-46. Arts IC, Sesink AL, Faassen-Peters M, Hollman PC. Br J Nutr 2004;91(6):841–7. Morand C, Manach C, Crespy V, Remesy C. Free Radic Res 2000;33(5):667–76. Olthof MR, Hollman PC, Vree TB, Katan MB. J Nutr 2000;130(5):1200–3. Erlund I, Kosonen T, Alfthan G, et.al. Eur J Clin Pharmacol 2000;56:545–53. Lotito, S. B., Zhang, W., Yang, C. S., Crozier, A., & Frei, B. (2011). Metabolic conversion of dietary flavonoids alters their anti-inflammatory and antioxidant properties. Free Radical Biology and Medicine, 51(2), 454-63. Formica, J., & Regelson, W. (1995). 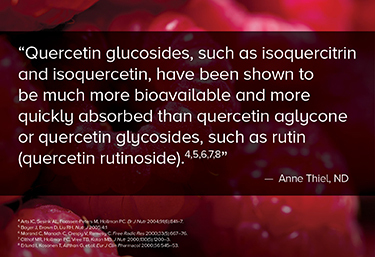 Review of the biology of quercetin and related bioflavonoids. Food and Chemical Toxicology, 33(12), 1061-80. Lu, N. T., Crespi, C. M., Liu, N. M., et al . French, S. W. (2015). A Phase I Dose Escalation Study Demonstrates Quercetin Safety and Explores Potential for Bioflavonoid Antivirals in Patients with Chronic Hepatitis C. Phytother. Res. Phytotherapy Research, 30(1), 160-8.